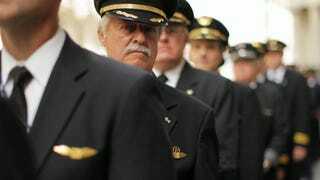 How Do Airline Pilots Respond After A Crash? After the tragic crash of Malaysia Airlines flight 17 on Thursday, and amid the wall-to-wall news coverage, I began to wonder about something we don't typically see on the news — How do these incidents affect pilots? I reached out to my pilot friend, Mike to find out. Do pilots discuss it together, either on the ground or in the cockpit? We do talk a lot about incidents and accidents, both amongst ourselves and within the company. Nobody likes hearing about accidents, but most of us in the industry have studied enough of them that we kind of become numb to the humanitarian aspect of a tragedy like this. I believe it is important to discuss these events as it becomes a somber reminder of the importance of the work that we do. Yesterday I was talking to a friend of mine who is also in the industry. We were remarking that being at work after a tragedy like this feels strange. It feels like everyone in the terminal is looking at you just a little more closely. I know people, especially nervous fliers, can be a little extra sensitive around these events. I feel a bit more motivation on those days to make sure my uniform is on straight and to work extra hard at projecting a professional image while at work. You never know who needs a little bit extra assurance that they are in good hands. As for why we talk about the events, it is important to learn from the mistakes of others. Even in this case where it appears the flight crew did nothing wrong, god forbid something similar happens to us, it helps a lot have a plan of action that you have thought about ahead of time. Bouncing ideas off coworkers can only help your learning process. What happens from the company side? On the company side, we may see a memo about an incident, but only if it is a kind of operation that is similar to ours. For example, we don't need to worry about escalating tensions on the Russia/Ukraine border, [being a U.S. domestic operator] so we probably won't see any official communication on the subject. But after the Colgan crash in Buffalo we changed the way we do a lot of things to avoid the same pitfalls.